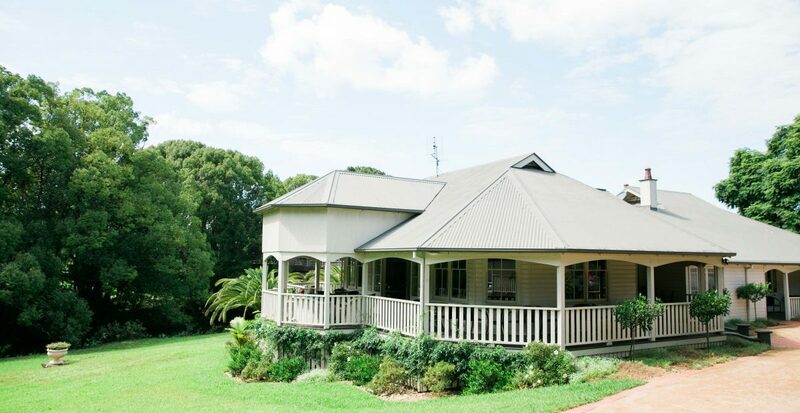 Built over a century ago, Bangalow Guesthouse offers guests the charm and elegance of a bygone era. Sumptuously furnished to the highest standard Bangalow Guesthouse offers the perfect setting for a romantic, relaxing escape. 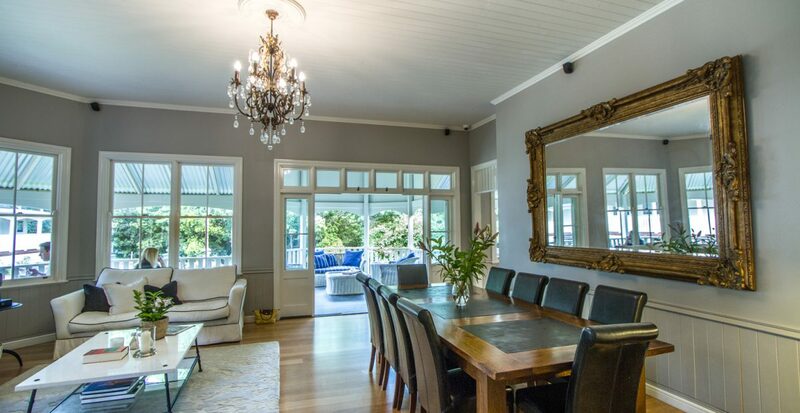 Bangalow Guesthouse sleeps 14 people (7 Queen and King beds), with luxurious accommodation options ranging from contemporary cottages to spacious suites. Comfort is paramount in this heritage property, with a grand living area and kitchen complete with the small conveniences of home such as cosy reading corners and full kitchen furnishings. The swooping veranda spills out on to the three acres of lush lawns, tropical plantations, a 100-year-old Mulberry tree and a flowing creek. It is a beautiful sanctuary of relaxation, perfect for getaways, events and ceremonies alike. Hidden within the Byron hinterland, Bangalow Guesthouse is situated in the heart of Bangalow’s charming town. A range of boutique shops, award winning cafe’s and historical walks are on our doorstep, ensuring there is always plenty to do. We look forward to welcoming you to our home and are delighted to assist in any way possible to. ▪ The property is not staffed full time, though assistance is always nearby should you need it. ▪ Bangalow Guesthouse is much-loved by many, therefore it is wonderfully maintained at all times and we appreciate your assistance in keeping it the beautiful oasis it currently is. Please take care to save electricity for the environment and maintain security by locking all the doors and windows when not on the property. ▪ We encourage guests to enjoy our fully fitted kitchen and living area, however, ask that guests please maintain the tidy environment and clean up after themselves as a common courtesy to other guests. ▪ Unfortunately, we cannot accept children or animals at Bangalow Guesthouse.